Frank Grillo was pounding a heavy bag in Beijing when he came up with the idea for the new Netflix series Fightworld. He was living in China while filming the action sequel Wolf Warrior II—which would go on to earn a box office-breaking $800 million—and had stumbled into boxing gym Fight Republic looking for a place to throw mitts. “Being an actor can be a lonely life,” Grillo told Men’s Journal after finishing a few rounds at New York’s Overthrow Gym. That’s especially true if you’re the kind of actor who always has two movies in the works and can look back at a laundry list of credits including Warrior, Captain America, Donnybrook, and the gone-too-soon series Kingdom. “You show up in a new city and get shoved into a lifeless hotel room,” Grillo said. “But I always knew I could find a community of my kind of people at the gym.” Now when he arrives in a new city, he drops his bags at the hotel and immediately finds a place to sweat. This ritual has sustained him throughout his prolific Hollywood career, not to mention helped him maintain his shredded physique. But on top of those benefits, he also made genuine friendships with fighters from all around the world. 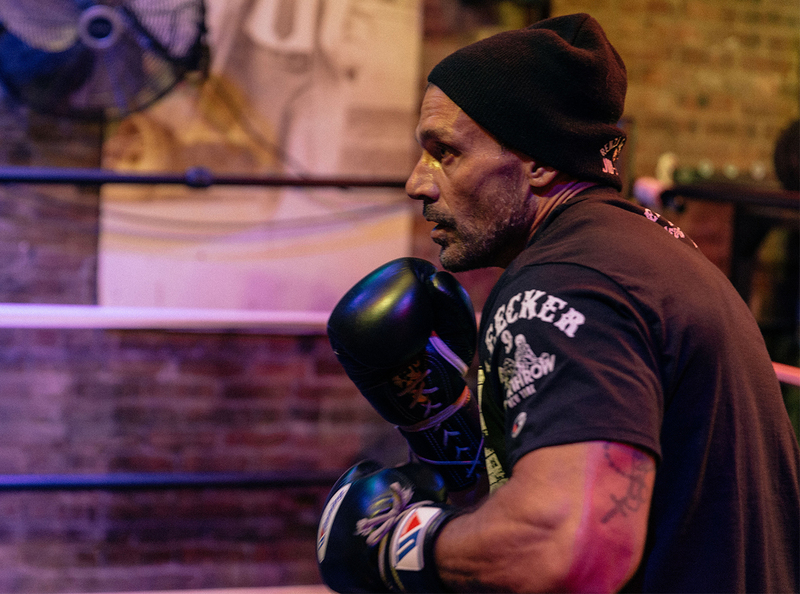 Spending time with these fighters gave him the idea of shooting a cinematic docuseries in the vein of Anthony Bourdain’s Parts Unknown with a focus on fighting gyms, and he brought the show to life with help from his producing partner Joe Carnahan and director Padraic McKinley. The first season took Grillo to Thailand, Myanmar, Senegal, Mexico, and Israel. The result is a beautiful and poignant look at five very different cultures, all connected by a mutual respect for combat sports, and according to Grillo, a better show than he ever imagined. How did you pick the locations for the show? There was a committee of us that chose the locations, and they were all picked for a purpose. We knew for the first season that we wanted to go to places where there was a lot of history and a narrative that we could tell. Not to mention I wanted to be able to have a personal connection to the people that we were speaking with. Some were closer connections for me than others, of course. Well first of all, I love boxing. That is my sport. So going to Mexico and seeing Julio Cesar Chavez was an obvious choice. I got to go with him to Azteca Stadium where he beat Greg Haugen in front of 90,000 people. He had not been there since that very fight. There was a lot of heart in our conversation; he was a guy who made it to the pinnacle, and had such a long and inspirational career. What was it like to go to Israel to train in Krav Maga? Israel changed my life. It is one of the most amazing countries that I have ever been to. I had an idea in my head of what it was going to be like. I entrenched myself with the soldiers there, the special ops guys, and spent a lot of time with their families. I think it is hard to put yourself in their mindset, when you are surrounded by these hostile nations that are focused on destroying the city. You can feel the tension there. I don’t care if you believe in God or not, you feel something bigger there. The city has this incredibly complex anti-missile system surrounding it called the Iron Dome. Go to Tel Aviv; it’s like Paris and everyone is having an amazing time, obviously they are aware. But that doesn’t stop them from enjoying life. Did you come out with a better understanding of where Krav Maga came from? There are tunnels on the Gaza Strip that enemies are trying to use to get to them with explosives. They are using Krav Maga to fight people in these tunnels. You aren’t fighting for points; you are fighting for the lives of you and your family. I saw you walked away with more than just a new experience in the Thailand episode. How do you like your new tattoo? What inspired you to get it? I saw all the guys fighting in the gym rocking these beautiful tattoos and I knew that I needed one for myself. I had tattoos already but getting a tattoo there is such a different experience. I was sitting there with this monk, eating gold leaf. The cost is whatever he wants, he could want money, cigarettes, any other sort of object that you have on you. There is this beautiful chanting that goes on during the process and he never leaves his seated position. Once he was done—I hadn’t even seen the tattoo yet—he had me bow over then he hit me on the back with this giant sword. I immediately went back to get another one from the same guy. I am big on balance when it comes to my tattoos, so I didn’t feel right until I got that second one. So not only did I get to train with Buakaw, who may be the greatest fighters that ever lived, in Thailand, but I also got two great pieces of ink. There is a strong Anthony Bourdain feel in this, and I could see him enjoying the show since he practiced Jiu Jitsu. Anthony Bourdain is a legend and an inspiration for me. I had this dream that he would come with me for our Brazil episode, since he studied BJJ. I know my limitations, so I was never seeking to become Bourdain. His character was so strong that he was able to be front and center of his show at all times, and it works beautifully. I didn’t believe that would be best for our show, though. I wanted to make the stories of these people, of these fighters, the true throughline. How do you end up making these powerful connections when you are just stepping into a new gym for the first time? I mean it isn’t like you’re walking in there looking for friends, but you start hitting a bag. People can hear the sounds; they can tell if you have thrown punches before. Obviously they know you are in from out of town, so they ask where. All of a sudden a conversation is started. Everyone goes their own way to finish their sessions but afterward someone talks about getting a drink at the regular spot. That is where I want to go, not some boring hotel bar. They become my guides to all the best places in their city. What drew you personally to fighting? I have always been restless. I have always been a seeker. It is one of the reasons that I train as hard as I do and I have studied as many disciplines as I have. I need to be challenged. This is the first time that I feel like what I put out into the world can help people and lead them in a better direction. What has the response been to the series so far? I can’t even begin to describe how positive the response has been, from people who have been coming up to me on the street to people all over the world online. It is a deeper response than I have ever experienced before from fans. I will be honest, it makes me not even want to act. Don’t get me wrong, it was fun to do The Purge, but at the end of the day there isn’t a lot of substance to work like that. Now I get these emails from people that will just start the tears. Where would you like to go for a second season? I want to go back to Brazil and do a proper episode. I trained with the Gracie family, who really established BJJ, so that is a place that I already have a connection with. I want to go to Uzbekistan, one of those places where combat is just steeped into their culture. I also would want to go in and do the culture of Navy SEALS. I would love to study Silat. There are so many great stories to tell, and I think the world needs more stories like these. Fightworld is now available on Netflix. This Q&A was edited for clarity.